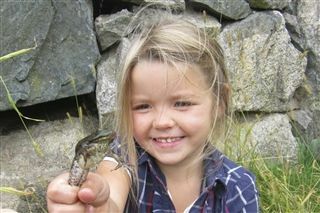 Our two swimming pools are ideal for young campers. One pool is a large, shallow pool designed for beginner swimmers, while and the other is an L-shaped pool with a depth of 3 to 8 feet. 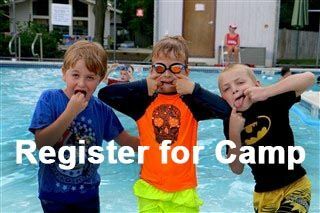 Full-day campers participate in an American Red Cross swimming lesson each morning and a free swim each afternoon. 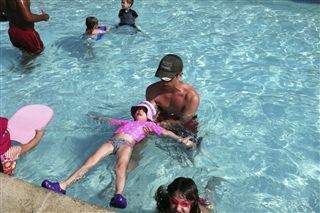 Half-day campers have one swim lesson per day. Pool staff are certified by the American Red Cross, and are experienced in teaching young children to swim and enjoy the water. The instructor-to-camper ratio during lessons is dependent upon the size of the camper group, but will not exceed 1:5. 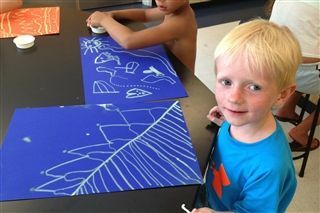 Tye-dye, painting, beading, and fun art experiments form the foundation of the arts and crafts program. Weekly themes inspire the projects produced in the arts/crafts room. 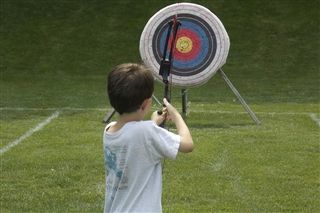 A certified instructor teaches children entering First Grade and above the skills of archery. 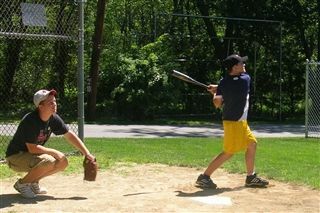 Aim, stance, and safety are the focus of this program. Traditionally a favorite with the DCD campers, Sports and Games time takes place in the large Rand Gym or out on the playing fields. Traditional camp games (tag, frisbee, relays, capture the flag, etc) along with some basic beginning sports (whiffle ball, badminton, soccer, kick ball) are all a part of Sports & Games time. Woodworking with kids? You bet! Campers are introduced to the the use of hand tools and will craft pieces to take home. In the past, birdhouses, name signs, planters, boats, and boxes have all been popular projects. 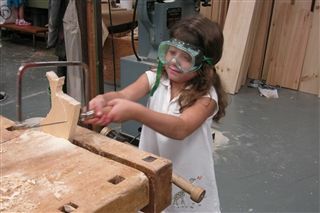 Campers entering Nursery and Pre-K come to the wood shop for wood sculpture and painting. 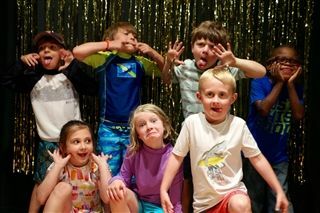 Campers take to the DCD stage to play silly improv games-including-Museum, Jewel Thief, Party Quirks, and much more. They will also show their talents while dancing on our stage, and doing acting warm up games. Everything your budding star needs to prepare for a show. Trekking through the marsh, or setting up a campground area in the pine grove, outdoor explorers will learn some basics of survival in the elements! Learn to pitch a tent, use a compass, or just take in the wonder of nature. Activities, experiments, and games are all a part of this piece of the camp program. Each camper enjoys cooking as one of their special activities one period per week. Recipes usually relate to the camp theme of the week (ie. Jello aquariums with candy fish for an Ocean Theme, or Red, White and Blue Cake for 4th of July theme , and so on).